I MUST admit I’ve changed my mind about Brexit after watching a BBC documentary on Thursday night. It showed a typical couple, Mr and Mrs Wildebeest, and their two children. Their once lush pastures have dried up and now they are being forced to re-locate. This has all happened since Brexit was announced. The documentary narrator didn’t say it was ‘because of Brexit’ because the BBC is impartial. But the implication was pretty obvious. And they had an independent analyst from Dog Whistle Research who, thankfully, was able to spell out the REAL truth. The once lush pastures of the Serengeti Plains have dried. There are multiple explanations given by the Fake News channels of the mainstream media. But we all know the truth. The amount of pasture consumption was unsustainable. The rain stopped, because of complications in the weather supply chain. Caused by global warming. That’s a fact, the science is over. Jean Claude Juncker and Guy Verhofmeister would have been able to stop it. But we don’t like foreigners, do we? You can sense the hidden hand of Jacob Rees-Mogg behind this. He wants to close down the NHS and bring back the chimney sweep boys and child labour. It’s all from Donald Trump’s White Supremacy Playbook. With a foreword by Adolf Hitler. 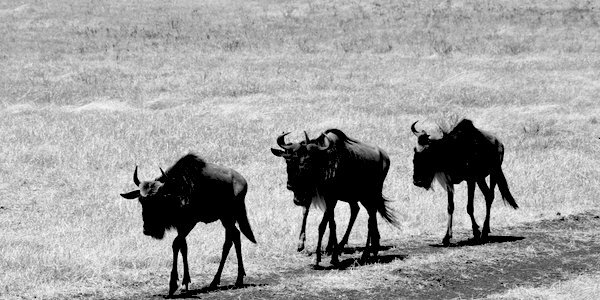 Now, as a result of Brexit, the Wildebeests are going to have to migrate. To make matters worse, one of the children is lame. He could be a target for Hyena Crime. Yes, hate crime against Wildebeest Communities is on the increase in Brexit Britain. Channel 4 News has a damning report from independent research company Anecdotal Agenda. It’s not just FBI-sponsored hyena attacks on vulnerable herd stragglers. Animals are turning on each other in desperation. Lions, cheetahs and even once peaceful crocodiles are launching sickening attacks on the Wildebeest, who are being scapegoated by the mainstream media. ‘Wildebeest should be standing on each other’s shoulders. But now they are trampling each other in the mud,’ said a tearful Jon Snow. Rain isn’t getting through. Pastures are down on this time last month. Ten per cent of the Wildbeest Herd has been killed or died. If we extrapolate that, and ignore all other variable factors, it means the entire herd will eventually be killed. That’s the hard evidence! As a result, the entire animal kingdom could be wiped out. The younger members would never have voted for a migration. The older members who do tend to be the ones who die out. There is hope that a new referendum will be held, and the vote against the cycle of life could be overturned. Still, it remains to be said: we are all suffering because of the older and wiser community, who trust their personal experiences rather than the Fake Gnus media. Won’t somebody think of the Wildebeest?